Grey-Tailed Tattler (Tringa brevipes) adult. Doing a little bit of surfing while in Australia. Wandering Tattlers being wiped out by a wave. They weren't watching. Wandering Tattler (Tringa incana) having a wing stretch. Ah yes it's good to be back in Australia for the summer holidays. "Hmm I wonder if she can see me?" Sometimes they just don't like getting their feet wet. Hmm, I wonder if she can see me? One is coughing up a pellet and the other is starting to develop its breeding plumage. 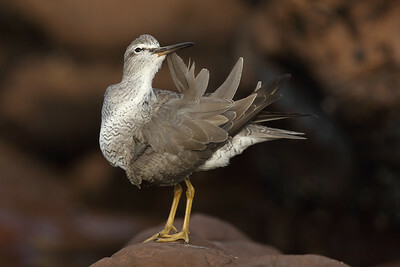 Grey-Tailed Tattler (Tringa brevipes) non-breeding plumage. In partial breeding plumage enjoying the morning sun. I love it when shorebirds have a little leg and wing stretch as it displays their beautiful feathers.